Livingston Man Busted for Allegedly Manufacturing Meth, CONROE, June 16, 2014 - Just after 3 am Monday morning Conroe Police were dispatched to Vernon’s Kuntry Katfish in the 5900 block of West Davis (SH 105). The caller stated a man was slumped over the steering wheel. 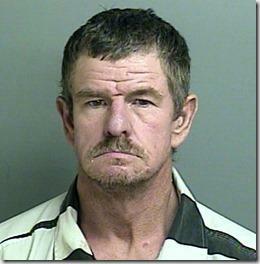 When Conroe Police arrived they found Kenneth Ray Lockhart Jr, age 54 ,of Livingston asleep in his car. As officers spoke to him they spotted a small bottle which seemed to be producing a gas vapor. Conroe Police immediately backed out and called the Conroe Fire Department Hazardous Materials Response Team. Once it was determined to be a small amount of meth the Montgomery County SIU Detectives were called to the scene. They determined it was what is described as a “shake and bake” lab. Montgomery County contacted the DPS MIG unit which responded and contained and moved the mobile meth lab. Lockhart has been placed in the Montgomery County Jail on a charge of possession transport chemicals with the intent to manufacture controlled substance (Felony).